Preheat over to 375 degrees. Grease and flour large cookie sheet. In a 2-quart saucepan over medium heat, heat 1 cup of water and 1/2 cup of butter until butter melts and mixture boils. Add 1 cup all-purpose flour all at once; with wooden spoon, vigorously stir until mixture leaves sides of pan and forms a ball. Add four large eggs, 1 at a time, beating well with wooden spoon after each addition until batter is smooth and satiny. Spoon 1/2 cup of batter into a decorating bag with a large writing tip. Onto a greased cookie sheet, pipe 8 3-inch long "question marks" for the swans necks. Make a small dollop for the head. Drop the remaining batter by large spoonfuls, pushing off with rubber spatula, into 8 large mounds onto cookie sheet. About 3 inches apart. With moistened finger, gently smooth the bater to round slightly. Bake 20 minutes or until necks are golden. Remove necks to wire rack to cool. Continue baking the cream puffs 45-50 minutes longer until golden. Remove to cooling racks. With a long serrated knife, slice cream puffs in half. In a small bowl, with mixer at medium speed, beat heavy or whipping cream until stiff peaks form; set aside. In large bowl, with wire whisk, prepare instant pudding as label directs, but use only 1 1/4 cups milk. With rubber spatula or wire whisk, gently fold whipped cream and almond extract into vanilla pudding. Cut off the top third from each cream puff and set aside. Spoon whipped-cream mixture into each cream puff. Cut each reserved top piece in half. Set into filling for wings. Place swans' necks into filling. Refrigerate if you do not plan to serve right away. anonymous : I used the eclair recipe for years, from my sisters magazine, and used vanilla pudding as the filler, now I can't find my recipe card. AND ITS NEEDED! kml9876 : Thank you. You're welcome. anonymous : Well, they are adorable! I love your recipes and I can't wait to try. Thanks so much! kml9876 : No it was not from Seventeen. It is in a cook book that I own. anonymous : Thanks for checking for the eclair recipe! Was the swan cream puff from Seventeen? I am so curious! I collect old Seventeen magazine recipes and would love to know! kml9876 : I can't find an eclair recipe. anonymous : Great recipe! Which magazine is it from? Is it from Seventeen? I'd love the eclair recipe, please! kml9876 : I will check to see if I have the eclair recipe. anonymous : I made these for the first time when I was 17, which was, well, almost 30 years ago. I lost part of the recipe (had torn it out of the magazine and it was wrinkled and torn as could be from repeated use), so I had to make do with other recipes. SO HAPPY to find the full recipe again. These truly are the BEST cream puffs ever! BIG QUESTION: This recipe was originally printed with a recipe for eclairs and the eclair filling recipe was also the BEST I've ever tasted. Does anyone have the recipe? If so, please print it. IT IS SO GOOD!!! 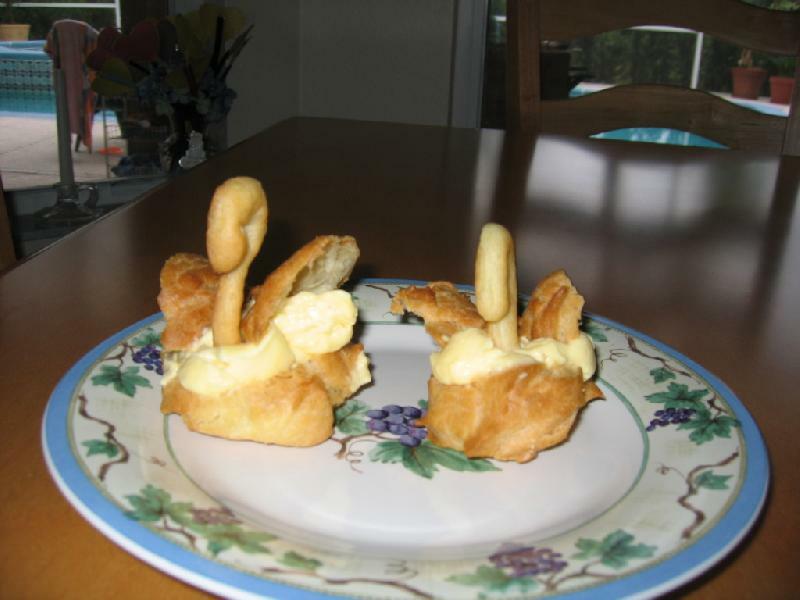 anonymous : great cream puff recipe. best cream puff ive ever had! ! ! Anyway you could sell that recipe to the president.like hed care though. anyway, awesome swan! ! ! ! !